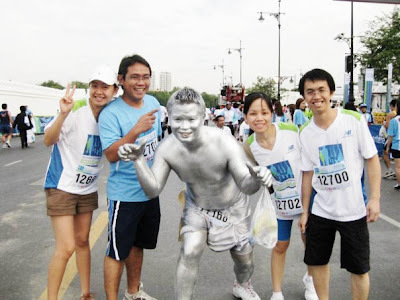 *the aluminum man is still the same person! Yay! I was looking if I blogged about the Run for Health Standard Chartered Bank marathon we participated on November 22 last year but I couldn't find any from this blog. Must have missed blogging about it. Anyway, this year the theme is Run for Good and it was held last Sunday, Nov 21, 2010. Did I mention I love the colar-less shirt? I hang mine in our men's clothing section at home because I really love it. I usually don't hang my t-shirts unless if it belongs to Hobbit. Okay, so I had two ponies for fun and I liked it when my hair kept slapping my cheek throughout the marathon because it so proofed that I ran like a 5 year-old. :) Well, I didn't run all the time yet one miracle was, this time I didn't stop for a second. I brisk walk when I needed a breather. Last year, I stopped and panted all the way because of my ill condition. Thank God this time I was well enough, no 'auntie' visiting. 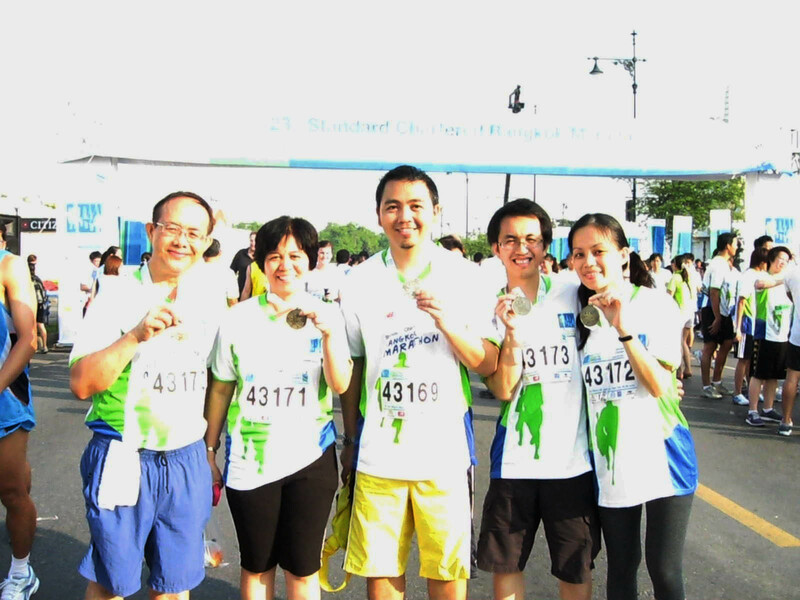 At the finish line, we collected our medals, and left without our free McDonalds jok. Yay, I hope you and Ropoy will continue to run for this marathon! Argh, I should've gone with you guys!